The Subcommittee on Disaster Reduction (SDR) is a Federal interagency body of the U.S. National Science and Technology Council under the Committee on Environment, Natural Resources and Sustainability. Chartered in 1988, the SDR provides a unique Federal forum for information sharing; development of collaborative opportunities; formulation of science- and technology-based guidance for policy makers; and dialogue with the U.S. policy community to advance informed strategies for managing disaster risks. Under its mandate, the SDR advises the White House Office of Science and Technology Policy (OSTP) and others about relevant risk reduction resources and the related work of SDR Member Agencies. Additional information about the subcommittee's mandate is available in the SDR Charter. Mitigating natural and technological disasters requires a solid understanding of science and technology, rapid implementation of research information into disaster reduction programs and applications, and efficient access to diverse information from both public and private entities. To help meet these needs, the SDR developed the Grand Challenges for Disaster Reduction, a ten-year national strategy document for prioritizing Federal investments in science and technology to reduce disaster risks and promote resilient communities. 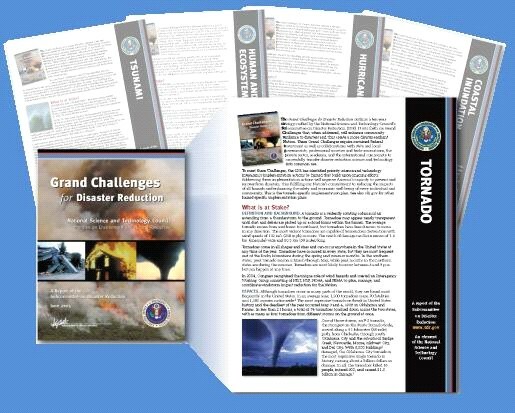 In subsequent years, the SDR has published a series of complementary, hazard-specific Implementation Plans that identify the actions that the Federal agencies, in collaboration with individuals and organizations at all levels, must take in order to meet the six Grand Challenges.